Here it is... 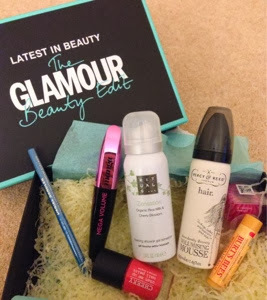 The Glamour beauty edit box - where Latest in Beauty team up with Glamour magazine to come up with a box full of what they consider to be the hottest products in the beauty market this Spring. For £18.70 (including P&P), you get to try 7 products. I have to say, I haven't used a pencil eyeliner for over a few years now. I'm a gel eyeliner addict, they tend to last longer without smudging (I'm using the L'oreal one). Back in the day, I would wear coloured eyeliners... Blue and turquoise would be the adventurous colours I'd go for. But not now. I'm not sure how I would work this as my eyes are dark brown but I will give it a go! Suggestions on how do a eye combination with this colour would be greatly appreciated! This was the one I was really looking forward to trying. I am forever trying to find mascaras to enhance my super short lashes (read my favourite mascaras in a previous post!). However, because the brush is so large, it can't really reach my inner and outer lashes that well and makes it look a bit too clumpy for my liking. It would be a good mascara to use for a night out though! I have tried their shower foams before and they feel so luxurious! It comes out as a gel and then as you rub it into your skin, it turns Into foam. If you love sweet scents, I would recommend the Yogi Flow, containing sweet almond oil and Indian rose. It smells amazing! This colour looks great for spring, I can't say I've heard of this brand before but I'm really looking forward to using it! I have used these bobbles before, I'm not sure if it was the same brand or not... I'm pretty sure it wasn't. Anyway, they're great if you don't want kinks left in your hair after going to the gym or even a day at work if you're planning to go out afterwards. However, they seem to stretch out if shape quite easily after a few uses which means it always falls out of my hair (I have quite thick hair). But as I have just run out of hair bands (does anyone else have the problem of hair bands mysteriously going missing?! ), I will give these a shot. I have heard a lot of good things about this brand. I've walked into Space NK many times and taken a look at these hair products but have never splashed out to try anything. This could be the start of something very dangerous! I always associate hair mousses with the more mature generation (we're all thinking it!) but I've noticed several brands have brought it back into fashion recently. I'm excited to try this! I have a slight obsession with lipbalm.. I can't actually live without it and can't sleep without putting some on. I've tried the pomegranate one but have never tried the original. This will be another one to add to my handbag. This is great! So many lovely products for a good value. I have included info about Mary Kay skincare and cosmetics on my blog, PreethiWorks...will continue to add more product reviews first day of every month.